A graduate student named Qian Qian Liu, will be speaking at the beginning of the next BrainTalks@UBC event. What she studies is part of a fascinating field. She studies semaphorins, small molecules that help guide neuronal growth. She will give us a brief but in-depth review of these molecules on January 19th, 2012. How do neurons grow? Neurons grow via a growth cone, an area at the leading edge of the developing neuron, that guides the direction of the axon development. The growth cone looks like a large round area teeming with activity at the end of a long straight growing axon. Several videos have captured what neuronal growth looks like. 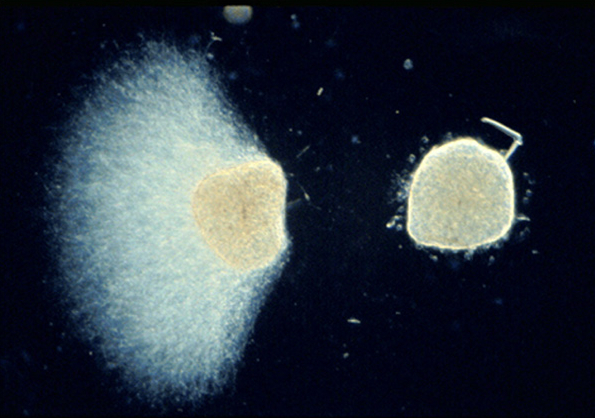 In the first video below, a semaphorin called Sema3A blinks like tiny transient stars as embryonic chick neurons grow. In the second video below, the growth of a neuron is described in detail while a phase contrast microscopy video is shown of the neuron as it develops. Sema3A was discovered when scientists at IRB Barcelona were curious how to solve the problem that adult neurons, once damaged, can not regrow their axons. 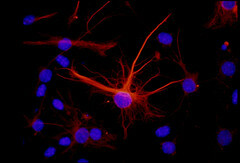 Various molecules were identified that cause the neuron to grow in a certain direction. Sema3A was of interest, as it both stops the neuron from growing in one direction, while encouraging the neuron to grow in a different direction. In mice, the amount of Sema3A increases when there is injury to a mature nervous system. Dr. Timothy O’Connor’s lab, where Qian Qian Liu works, looks at several molecules that shape how neurons grow. More specifically, his lab investigates the sprouting of axons, and the regeneration of neurons, with consideration that these molecules may lead to therapeutic interventions for neurodegenerative diseases. Although schizophrenia isn’t a currently classified as a “neurodegenerative disease” or dementia, it was originally recognized as a type of dementia, called “dementia praecox” by Emil Kraepelin in 1893. He described dementia praecox, later to be known as schizophrenia, as different from other psychoses, in that people with this particular pattern of symptoms seemed to decline cognitively over the course of their lives. What are the underlying biological reasons for this decline in cognition? 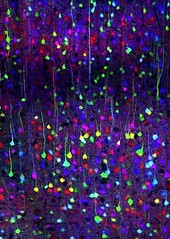 The biological workings of the developing neurons in schizophrenia, is an area of growing knowledge. Recently, schizophrenic neurons have been found to behave differently in the initial stages of growth. When USA scientists collaborated to grow schizophrenic neurons and watch the pattern of their development, they observed that the schizophrenic neurons didn’t connect to each other the way that normal neurons would. The resultant pattern of connectivity thus was much more sparse, less dense, than non-schizophrenic neurons (see photo below, Brennand et al, 2011 Nature). Why does this happen? 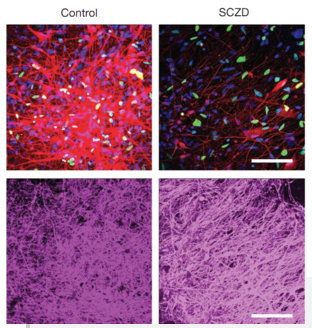 In part, because the schizophrenic neurons are low in proteins that build the connections between neurons. Also, the genes that help neurons connect with each other behave erratically. But what about the chemicals that guide the axons? It turns out that there are different levels of guidance molecules in schizophrenic people, at least in preliminary studies with few subjects. Researchers at Oxford University have found increased levels of Sema3A and decreased levels of reelin mRNA, which helps determine development. The researchers postulate that differences in guidance molecules may change the degree of synaptic plasticity that people with schizophrenia have, and thus their ability to learn and respond to environmental cues (Eastwood, Law, Everall, Harrison, 2003 Molecular Psychiatry). 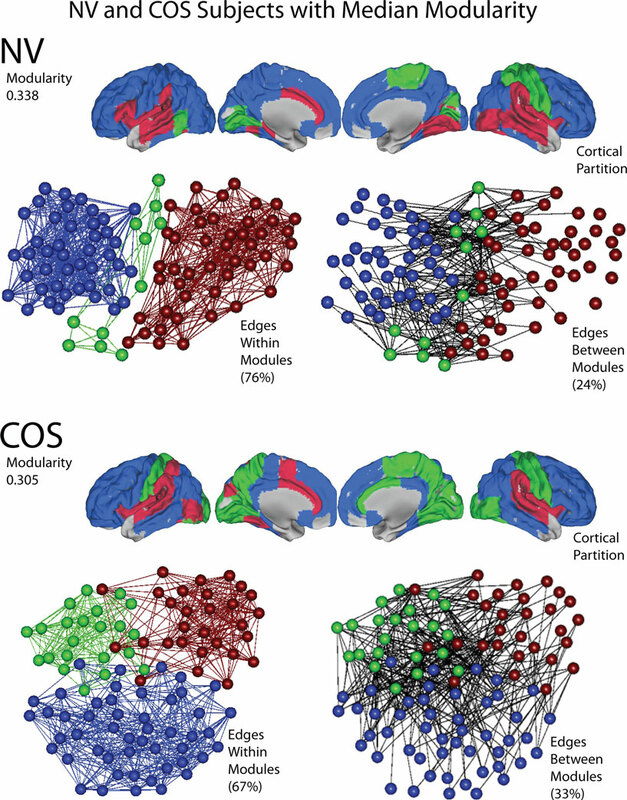 Recent research on connectivity in the brain, also demonstrates less connectivity in schizophrenics versus non-schizophrenics, at a larger scale. Human brain connectivity, or Human Connectomics, is an area of study that investigates the way different areas of the brain connect to support different functions. Dr. Vince Calhoun of the Mind Research Network, calls connectomics the study of the brain’s “inner twitter”. At the last Organization for Human Brain Mapping Conference, an all-day course on the Human Connectome covered many aspects of this field, ranging from genetics, to computational analysis, to functional mapping of brain structures, to identifying networks that are activated when a person thinks in order to complete a specific task. Pathways between regions are longer, and there are less connecting pathways, in people with schizophrenia, than in non-schizophrenics. In the photo below from Dr. Alexander-Bloch’s article published freely in Frontiers in Systems Neuroscience, you can see the difference between the connectivity in normal controls (NV) versus people with schizphrenia (COS), (Alexander-Bloch et al, 2010 Frontiers in Neuroscience). What are the reasons for the differences in connectivity in schizophrenia? Is it possible that the reduced efficiency of these connections lead people with schizophrenia to ‘jump to conclusions’ more often, thus creating delusions? Or could their be connectivity differences between visual and auditory areas that lead to the production of hallucinations? Join us on January 19th, 2012, at Vancouver General Hospital, for expert opinions and open discussion on these areas of inquiry into the workings of the mind. Click on the images below to find playful websites on neuroscience and the arts.